We’d love your help. Let us know what’s wrong with this preview of Breaking Her Defenses by Bailie Hantam. With his last breakup, he was left so disillusioned he not only swore off relationships but even took an extended break from the work he loves. Johannesburg… City of Gold. City of Love? To ask other readers questions about Breaking Her Defenses, please sign up. I like a romance where one or both of the lead characters have a painful past. Because... well, love heals all. Breaking Her Defences scores on both. Adam Cooper is a good guy who wanted a relationship, he's been engaged twice and has been hurt twice. Whats worse, both girlfriends made him feel it was his fault, so he's lost faith in himself as a potential husband. A really shame because he comes from a large loving family, the kind who are always in an out of one-another's houses, in and out of I like a romance where one or both of the lead characters have a painful past. Because... well, love heals all. Breaking Her Defences scores on both. Adam Cooper is a good guy who wanted a relationship, he's been engaged twice and has been hurt twice. Whats worse, both girlfriends made him feel it was his fault, so he's lost faith in himself as a potential husband. A really shame because he comes from a large loving family, the kind who are always in an out of one-another's houses, in and out of one-another's business. Holly is the opposite. She's lived alone, there is a big sad reason but you;ll find out when you read. So he never even tried to have a relationship longer than a 3-night stand. She craves a family but can't have one. I am always in awe when I discover a new author with a debut book that amazes me. This newest release is no different and a definite must read for anyone who love to read a really great romance story. Well written, characters are fantastic and a relatable story are just a few reason that I highly recommend this read. I need the rest of the family story and hope the author writes their story. This book was so worth the read with the great character and storyline development that kept me totally captivated as I turned each and every page! This was the first book that I have read from this author and it definitely will not be the last! Adam Cooper is married to his job, and he has two failed engagements to prove it. His last break up has left him reeling both personally and professionally. He has all but given up on finding love until Holly Monroe unexpectedly shows up in his life. Holly's life has been far from easy. She lost her parents at a young age, and she has always ached to have a loving family. Now, for the very first time, she has some hope that her dream might actually come true. However, her plans don't include falling in love with the close knit Cooper family. She really wants to let them all in, but she has only ever had herself to rely one, and old habits are hard to break. Breaking Her Defenses by Bailie Hantman is a gripping and beautiful love story. It's full of unconditional love based on a dark past, one that has broken their hearts but that only themselves can mend, and subsequently heal each other. Breaking Her Defenses is Adam and Holly's journey through life, love but most importantly to each other. You will particularly like how strong they evolved to be and how they remained true to each other. 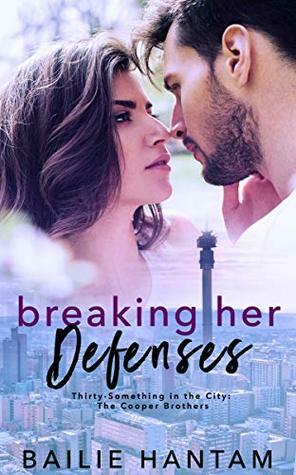 So many factors could have ruined their relationship but they Breaking Her Defenses by Bailie Hantman is a gripping and beautiful love story. It's full of unconditional love based on a dark past, one that has broken their hearts but that only themselves can mend, and subsequently heal each other. Breaking Her Defenses is Adam and Holly's journey through life, love but most importantly to each other. You will particularly like how strong they evolved to be and how they remained true to each other. So many factors could have ruined their relationship but they fought with all their might and endured a lot for a relationship that blossomed into a poignant love story. Breaking Her Defenses invites us, urges us to let go of our own personal mask that we seem to be hiding under to embrace our own "uniqueness", who we truly are. It presses us to take a good look inside and to stop pretending or try to live up to social expectations. The only important thing is to be personally in charge of our own destiny. First i need to say that, I for one, hope to be reading more of this family. This was really great reading. Holly needed a change in her career and made a choice to move. She came across a room for rent through her real estate agent, or flat as the author says it, which I liked. Within the first few seconds of getting to her new place, she meets Adam. And from what we all will gather, he is already smitten with Holly. There is more to this story of course, but you won't find much of a spoiler al First i need to say that, I for one, hope to be reading more of this family. This was really great reading. There is more to this story of course, but you won't find much of a spoiler alert from me I'm afraid. You'll need to read this one for yourself to find out what this one is all about. I cannot believe this is a debut author. Seriously I'm in shock. This was the kind of book I expected from someone with more than a few books under their belt. It is full of drama and secrets, plus love the fact it talks about the struggles SA is currently going through with load shredding. Cannot wait to read more from this author as many of the characters hinted at back stories, and as I fell in love with every one in the tight nit bunch, I can't wait to learn them all. Bravo Bailee Hantam, you're I cannot believe this is a debut author. Seriously I'm in shock. This my first book by this author. It will not be my last. I can not wait to read more from this author! I really enjoyed the characters and their story. I loved the family and the insights to each member and how their relationships play a role in the story. How far one will go to make their dreams come true? Is it worth It? A highly recommended read. Check this one out! I am voluntarily leaving my review after reading an advance copy of the book from the author. I'm really impressed with this book and author. Congratulations on making me fall in love with the Cooper family. Fantastic characters and great story line. Holly was very likable and a good for Adam. The writing style is a little different than I'm used to, but still a fantastic read. Can't wait to hear more from this family! Adam meets Holly when she moves into the flat his mother rents out. Adam knows she has a past and secrets but will she trust him with them? She’s moved to a new area & is desperate to get her custody of her brother can she succeed? Looking forward to reading more from the family. Great debut book! Really enjoyed Adam and Holly’s story. Looking forward to reading more by this author in the future. What a great first book by a new author. Adam & Holly are a beautiful couple that I can say I was truly rooting for. I fell in love with the Cooper family and really hope to see more of them. This was the first book I have read by this author, but it won't be my last! This book drew me in from the start! Holly & Adam. A unique and interesting story line. An awesome book. Well worth the read! !